Exhibiting at a conference this Fall? This eBook can help you succeed. 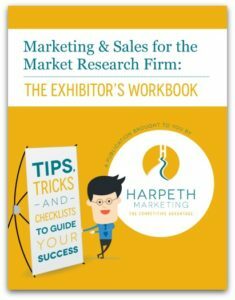 Harpeth Marketing is pleased to announce the release of our 6th eBook, Marketing & Sales for the Market Research Firm: The Exhibitor’s Workbook. Done right, exhibiting can be an outstanding marketing vehicle that helps you to generate highly-qualified sales leads, launch a new product or service, generate market awareness and support your association.